Today’s thermostats do fundamentally the same thing, activating some type of switch with the rise and fall of room temperature, but the technology has come a long, long way since then. 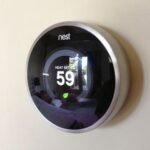 A state-of-the-art thermostat, probably best exemplified by the Nest Learning Thermostat, learns a family’s behaviors and preferences, digests this information, and controls the temperature accordingly—essentially programming itself. When connected to a home’s Wi-Fi, it can be managed remotely from a smartphone, tablet, or laptop computer. For more about this, see Home Thermostat Features. Many homes built before the 1980s are equipped with obsolete, low-priced thermostats that did an acceptable job before home energy cost and usage became a major concern. Fundamentally, that older type of thermostat is okay as a simple heat-activated switch, but it lacks a level of automation and control that is necessary for energy efficiency. “Okay” isn’t good enough anymore. 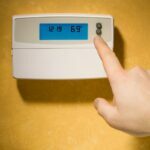 Older, low-efficiency thermostats waste energy and, because of this, they should be replaced with newer programmable electronic thermostats that can be programmed to maintain different temperatures during the day and night, eliminating periods when the furnace or air conditioning unit would otherwise run unnecessarily. For information on buying a new thermostat, see Thermostats Buying Guide. Essentially a heat-activated switch, a thermostat has a temperature sensor that causes the switch to open or close, completing or interrupting an electrical circuit that runs the house’s heating or cooling system. It can do this job either mechanically or via electronic circuitry. For more about the technologies inside of thermostats, see How a Thermostat Works. Because it is responsible for controlling the balance between your family’s comfort and the cost of home energy, a thermostat should be properly maintained. Although caring for a thermostat is normally quite easy, problems with the heating or cooling system can often be traced to thermostat issues. 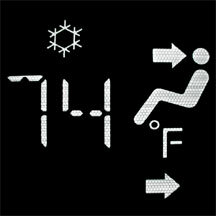 For information on thermostat care and repair, see Thermostat Repairs. 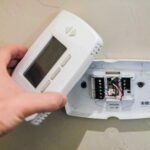 In most cases, replacing an older, non-programmable thermostat with a fully programmable model doesn’t require a professional HVAC contractor; you can do it with a little know-how. See How to Install an Electronic Thermostat for instructions on how to do this.